Brian Leetch played in the NHL for 18 seasons, with the majority of those seasons being with the New York Rangers. In his rookie season, he was named the rookie of the year following his 71 point campaign (1.04 points-per-game). No rookie defender has matched his 23 goal performance. He would reach the 20-goal plateau four more times. 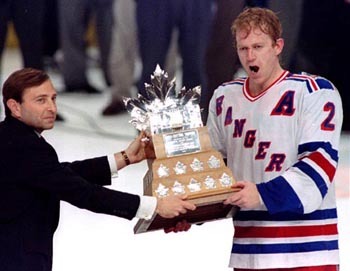 In the 1994 Playoffs, he played a key role in helping the Rangers win their first Stanley Cup in 54 years. In that championship run he scored 34 points from the blueline, including 11 goals. He was awarded the Conn Smythe for his performance in the post-season. He was the only American-born player to win the Trophy until Tim Thomas took home the silver in 2011. Leetch was selected to play in the All-Star Game nine times. In 1993-94 he registered 328 shots on net, with 23 finding twine. He would later be named captain in 1997, where he served as team leader until 2000. He was a great playmaker at the point and accumulated 781 assists over the course of his career. It was because of this that he was named to the NHL First All-Star Team twice and the Second All-Star Team three times. He was also a quarterback on the power play, notching 431 assists with the man-advantage for his career. Not only was he a playmaker, but he was no stranger to shooting the puck either. In the 1991-92 campaign he scored 102 points in 80 games. Only four defensemen have accomplished such a feat. He is arguably the best American-born defenseman to ever play the game, winning two Norris Trophies to help his case. He was inducted into the United States Hockey Hall of Fame in 2008 right before he was inducted into the Hockey Hall of Fame (Toronto) in 2009. The New York Rangers honored Leetch by retiring his jersey in 2008. If MacInnis was remembered for just one thing, it would be his booming slap shot. He preferred to use only sticks made from wood, even as that style became obsolete. Who knows how hard his shot would have been using more modernized sticks. Anyone who has seen his performances in the “Hardest Shot” contest in past All-Star Skills Competitions has thought about that. 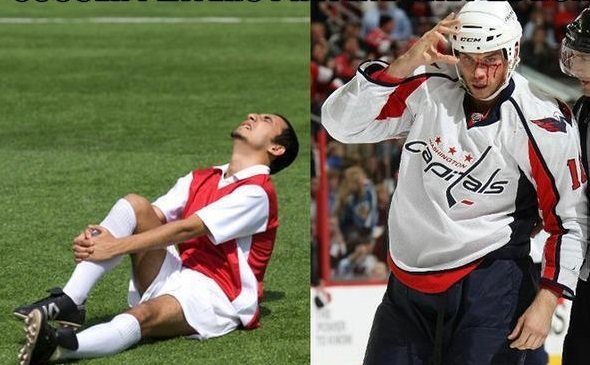 His hardest shots were always recorded around 100 MPH. He won the contest seven times. His shot was not only lethally fast. It was incredibly accurate. He once even scored a goal from the red line! He terrorized netminders league-wide for 23 NHL seasons. 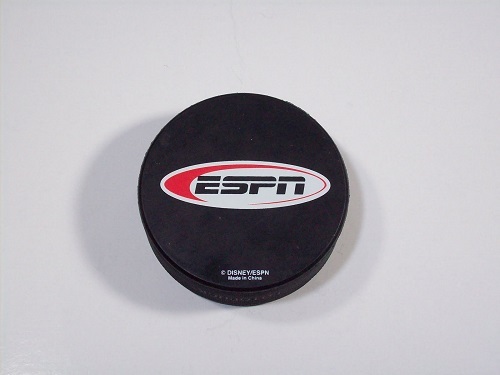 In total he launched the puck 5,157 times over the course of his career. 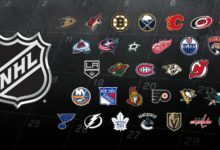 Only Marcel Dionne and Ray Bourque had more. In 1984 (his 3rd season in the NHL) one of his slap shots struck Mike Liut (goaltender for the St. Louis Blues) so hard that it split his helmet. To make matters worse for Liut, the puck trickled past the goal line after all. In 1988-89 MacInnis scored 31 points en route to a Stanley Cup victory for his Calgary Flames. His performance earned him the Conn Smythe. Exactly ten years later, he would win the Norris Trophy. He scored 20+ goals an unbelievable seven times. He was selected to the First All-Star Team four times and the Second All-Star Team three times. He also played in 12 All-Star Games. He ranks 15th all-time in assists (934) and 34th in points (1274). Among defensemen he ranks third all-time in goals, assists, and points. 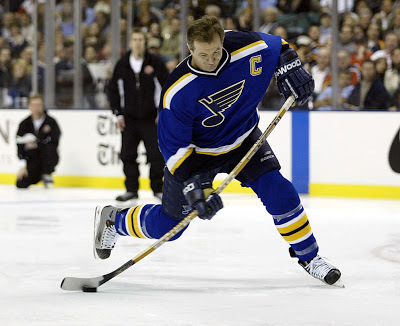 The Blues retired his #2 jersey the year following his retirement in 2006. MacInnis was inducted into the Hall of Fame in 2007. 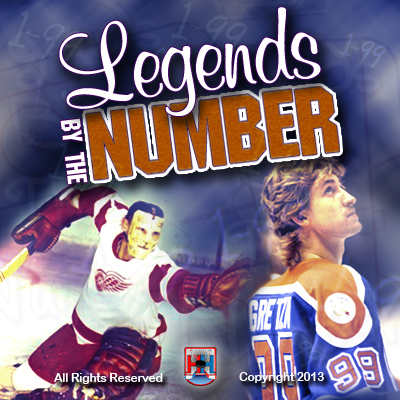 Note: He wore #5 in 1967 with Detroit (he only played in two games for the Red Wings. When talking about the greatest defensemen of all-time, one’s argument is incomplete without the mention of Doug Harvey. Let’s just start out by listing his accomplishments. 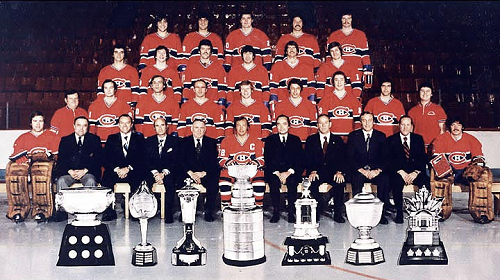 First and foremost Harvey won the Stanley Cup a total of six times, all with the Montreal Canadiens (the last five were won in consecutive seasons). He won seven Norris Trophies in eight years. He was named to the All-Star team in 11 consecutive seasons (10 on the First Team). He wasn’t known for putting up points, but he was as solid as they come in his position. 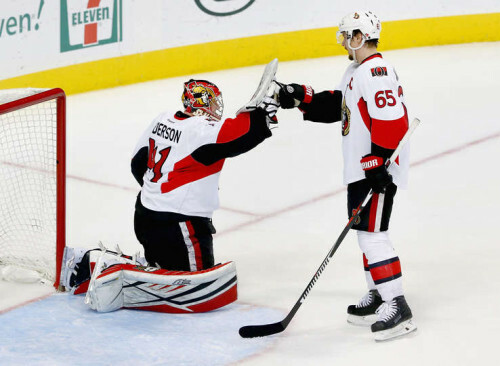 In this era, defensemen are often judged by their play and their point production. In Harvey’s day that wasn’t the case. Harvey was a complete player who worked harder than most and gave it everything he had each night. He was never afraid to give his body up to block a shot or play a physical game. That physical game is is seen in his career penalty minute total of 1,216 minutes. 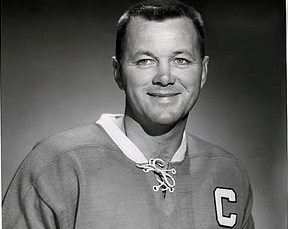 He was named captain following “Rocket” Richard’s retirement (1960). However, his captaincy wouldn’t last long. He would soon be moved to New York after being blacklisted from the league for being involved in the formation of the first players’ association. After being traded to the Rangers, a team that hadn’t made the playoffs in four consecutive years, Harvey successfully led his new club into the playoffs. In fact, he served as the team’s coach that season as well. In the same season he won the Norris and was named to the First All-Star Team. Harvey was elected to the Hall of Fame in 1973 and his jersey number would be retired by Montreal 12 years later in 1985.